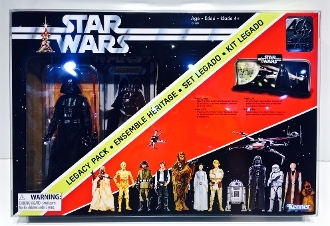 1 custom made box protector for the Star Wars 40th Anniversary Legacy Pack. Perfect fit and very well made! These are so large they will almost always ship in a separate package if you buy mulitple items. These can be shipped Internationally but the website is not charging the correct amount for shipping so you would need to contact us for the proper cost if you would like this item. It is just so large that it is causing shipping problems on International orders.